First Things First – You’re Here, Now What? I have had the delight of working with several new fundraising professionals in the past weeks, all of whom were hired to their positions with very little direct experience in fundraising, but with great enthusiasm for their respective organizations. One of the things I love about development is the abundance of opportunity for the entry level professional. Many of the fundraisers I know (including me) got their start by accident: throwing in for a good cause, showing some aptitude for or interest in development, and subsequently being handed the reins as development officer. Yeah! 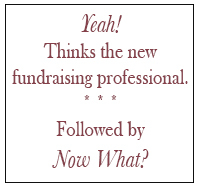 Thinks the new fundraising professional. The downside to this is sometimes these opportunities are available by virtue of the fact that small nonprofits rarely allocate enough resources to the development function to be successful. They therefore cannot normally entice seasoned professionals with generous (or sometimes even adequate) salary and benefits packages. The best they can offer is the chance to make a difference for an exciting cause. Lack of resources is not the only reason there is tremendous turnover in development. Another is the fact many small to medium-sized organizations don’t understand the development function. They may place unrealistic expectations on the shoulders of their inexperienced but enthusiastic new professional – who may not know enough at the outset to object – resulting in a tremendously dissatisfying experience for everyone involved. If you are in such a position, know that you will need to dedicate a significant amount of time throughout the course of your career (not just at the beginning) to learning about your job. I have been a fundraising professional for more than twenty years and still take time on a regular basis to bone up on strategies on how to work with fundraising volunteers, for example, or how social media intersects with development, how to start a new campaign, or the latest trends in the philanthropic world. 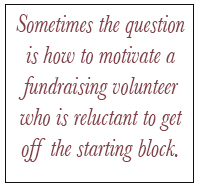 Not every fundraising professional finds herself in exactly the same situation. Each organization is different from every other. It may be a fledgling nonprofit, in which new staff are working with the founding board and executive director; it may be an established organization which finds itself in a position to develop a fundraising strategy in the wake of becoming independent from a parent organization. For every board member, though, or director who tells me “our organization isn’t like the those you’re used to working with,” I find there are a lot more commonalities than differences. It’s true, each organization is unique, just like each donor. Therefore, creativity and flexibility are keys for success in development. But there is an established and sound methodology to fundraising. Understanding fundamental best practices and the philosophy behind each, developing a solid plan and sticking with it, and dedicating oneself to professional development and growth are all critical to the success of the development professional. Development is in some ways just as challenging and rewarding for the seasoned professional as it is for the neophyte. In the coming weeks, I’m going to share what I might do upon entering a new organization – whether it’s stepping into a role that’s been vacated, or as the first development professional for the organization in question. As we progress through the following topics (and others I might develop along the way), I’ll include links to those entries below. What would you like to know as a new development professional? Or wish you knew upon embarking on your career? Let me know and I may include your chapter in this series. Inspired donors? How about inspired askers? 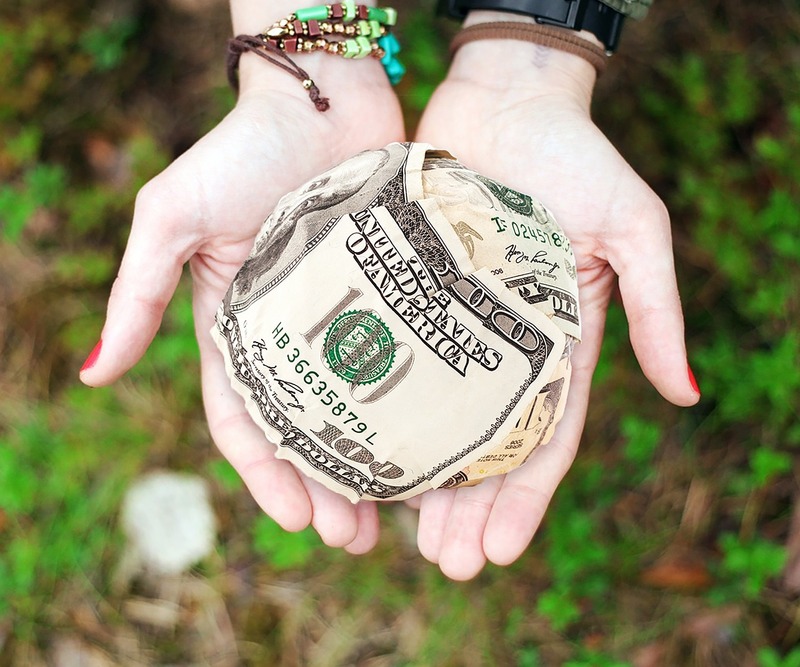 Fundraisers are familiar with this scenario: A volunteer is set to make a well thought out call on a potential donor: armed with knowledge about the prospect, a great case, illustrations, and budget figures. Then he hesitates. Is this the right person to ask? The right amount? The right time? Out of all of the groups I’ve worked with, not one has characterized their group as adept at fundraising. Not one. Many have been particularly down on their group’s ability and/or willingness to engage in development. Some have told me they think members of their group are actually going to be hostile when the subject comes up. Mike and I kvetched at the kitchen table this morning before work about the difficulties involved in fundraising. After listening to me go on about my job for twenty years, he knows quite a lot about what’s involved in asking someone for money. Still, he considers himself a newbie. Recently he’s made a conscious decision to be more active in fundraising on behalf of two organizations. He got involved with our local YMCA Strong Kids Campaign. He’s coordinating a board fundraising training for another group and has volunteered the two of us to launch a series of house parties to set a good example. He set out on some initial fundraising tasks with a great deal of enthusiasm. He made a commitment of his own gift, familiarized himself with the mission and message of the organization, scoped out some good prospective donors, strategized his approach, set up his meetings and asked for support. Twice. He received two polite but definite declines. He, like any rational adult, sees this as rejection. Fear of rejection is the primary reason people don’t launch themselves confidently into the world of fundraising. In his mind, his fear has just been substantiated. But to me, these two asks were successes. 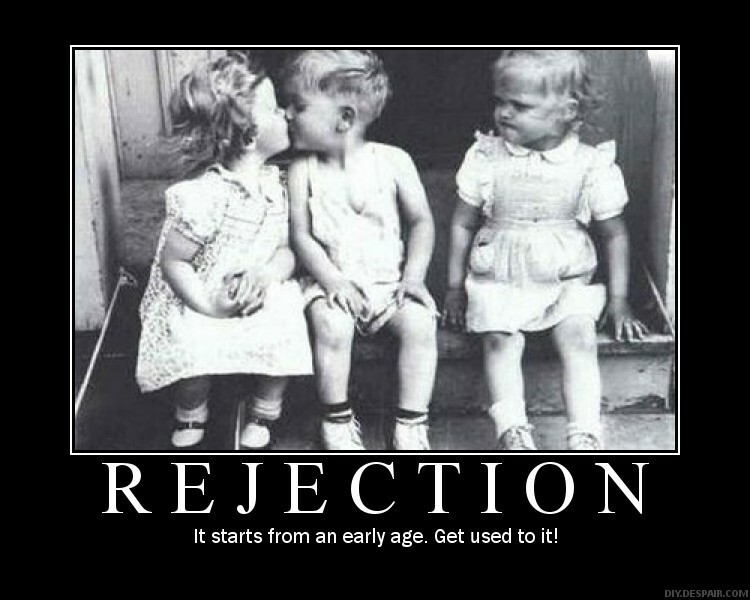 Although he’s discouraged with the result, he’s proved to himself that he can weather rejection. If the organizations working with him are smart enough to realize his potential, they’ll make sure he knows just how valuable it is to them that he put himself out there at all, and work with him to do it again. The only sure “no” in fundraising is in response to the request that’s never made. Even a “no” in response to a direct ask isn’t necessarily a “no” forever. In my husband’s case, one denial came from a company that really has no philanthropic history. The headquarters isn’t based here. They don’t sell their product here, and the connection between successful recruitment and ongoing employee satisfaction and the work of the organization was not as compelling to them as it should be. But it may be that he started some gears turning, somewhere, and the next time someone asks, they’ll be more open to the possibility of charitable giving. In the second case, he missed the company’s budget cycle, but learned more about their criteria for giving (nonprofits with heavy company involvement get first dibs), their visibility and marketing objectives. I’ll bet if he times his ask better, and brings information about direct employee involvement in the organization next year, he’ll have a shot. In both cases, he made his case. After that a “yes” or a “no” can hinge on so many variables that have nothing to do with the person making the request. The important thing is reaching out in the first place. We can research, develop our case, strategize and go back to the drawing board any number of times and never get anywhere because we don’t actually ever pull the trigger. We have no hope of hitting the target otherwise, but statistically speaking, even when we do fire, we’re still going to miss once in a while. We might as well start somewhere. I had a great assistant at one point who could work the phones like a boss. She got me in front of more potential donors than I ever could do on my own. Her background was in telemarketing, and she said the only way to avoid letting that job crush her soul, was to turn it into a mental game of averages. She knew she would be successful about one in 20 times, so she started to celebrate a little for every “no” she got, knowing she was closing in on a “yes” eventually. The work we’re asking of our volunteer board members and other fundraisers isn’t soul crushing. It isn’t scrounging or begging or scrambling for money. It is noble and it is worthwhile and it is something they should hold their chins up about. But that doesn’t mean that even the best fundraisers are going to get a positive response every time they ask.